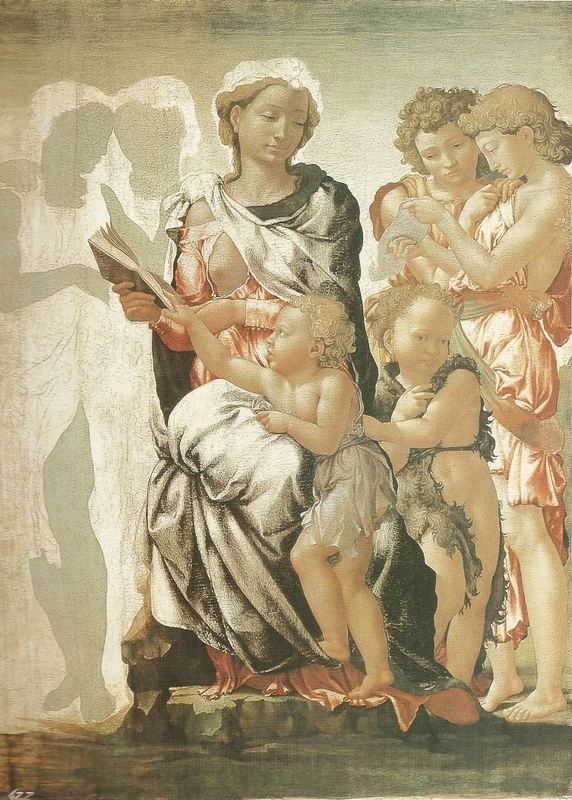 The Manchester Madonna is an unfinished panel painting attributed to Michelangelo. There are only three known panel paintings which have survived and this one is dated c.1495-1497, Michelangelo’s first period in Rome. The painting depicts the child Jesus with his mother Mary meeting his cousin, Saint John the Baptist, on the family’s return from Egypt. Mary has one breast exposed as if she has just fed the child, a theme common in medieval paintings of the Virgin. Mary holds a book just out of the holy child’s grasp while two angels stand in the background reading from a scroll. Another pair of angels remain unfinished with just the green pigment of their skin showing. The background is simply blank, or perhaps an expanse of sky, rather than a proper landscape. The painting, formally known as The Virgin and Child with Saint John and Angels, first appeared in Manchester in 1857 and caused quite a stir as it had just recently been attributed to Michelangelo and crowds flocked to see it with over 1.3 million visitors in five months, thus acquiring the title, The Manchester Madonna. The painting now stands as an unfinished work in the National Gallery of London, England.